In My Creative Opinion: Happy Birthday Darnell! Happy Birthday to my dear friend both on and off of blogland Darnell! You are just the sweetest and true person who is adored by so many! Darnell is always there to leave sweet and thoughtful comments on everyone's blogs and she has so often been there for me off camera to check in and see how I am doing and to let me know that if I ever need anything to let her know. She is a rare gem who always has a laugh for us on her blog and I am so truly thankful to be able to call you--friend! Bev and Ardyth organized a birthday blog hop for Darnell and Bev is hosting the party HERE and Ardyth is hosting the link up HERE which is staying open for two weeks! 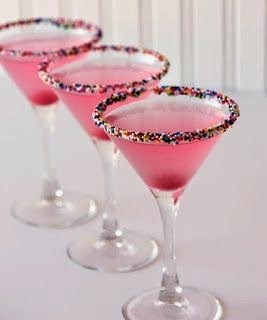 Now since Bev more than covered the cakes for Darnell, I am setting out a tray of Birthday Cake Martini's! Enjoy your blog hop Darnell and all of the love that is being sent your way! I used inspiration from The Cutting Edge Challenge #1 for my card. I chose a die cut popsicle and large speech bubble inspired by the large star and sentiment die cuts from the inspiration photo. I also used the sketch from CAS(E) this Sketch #82 when creating Darnell's card. Love your fun birthday card, Tracey! The citrus color combo is so pretty, and your Popsicle looks yummy! LOVE your Birthday Cake Martini's, too...I'm sure if she could make it happen, Darnell would be sitting right next to you enjoying one! Such a lovely and thoughtful way to wish her a Happy Birthday! Such a fun card for Darnell...love that popsicle! so cute! love that popscicle! Oh, I love the colors and paper you used Tracey. Great take on the sketch too. Thanks for playing along at CAS(E) this Sketch! This is adorable! I loveeeeeee the Popsicle!! Happy birthday to your friend!!!! Very creative card. The Popsicle is amazing. Great birthday card. This is super cute! How fun to use the number paper in the popsicle! And I so want one of those drinks! LOL! Super fun and perfect for summer time! Love the yummy Popsicle! 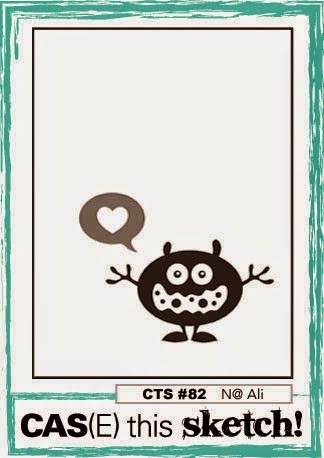 that ice-cream is so cute.. such a fun card.. This is so adorable! I just love the numbers nestled inside the Popsicle! Priceless!! Tracey, this is so sweet and just too darn cute! I love, love, love your ice cream, and I am sure Darnell will too. Ha ha Darnell is the one who introduced me to the jump button, I had no idea a long time ago what it was. 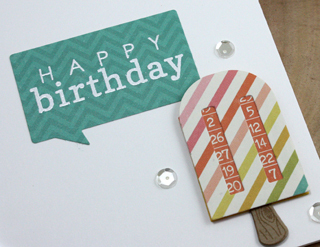 Love this fun popsicle card , just too cute for summer. So cute and fun! Love that popsicle! what a lovely tribute to Darnell, Tracey - love this cool popsicle die - how cute!! Nothing better than a sweet summer popsicle to help celebrate Darnell's birthday. I know she will love this one. Well, how freakin' cute is this?!! Darnell is such a lucky girl to have such talented friends such as yourself - so in love with that popsicle!! 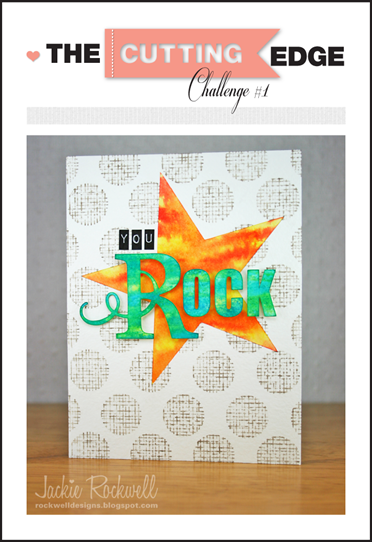 Thanks so much for playing with us at The Cutting Edge Challenge - we're so glad you did!! Looking forward to seeing more of your beautiful work! Oh, I love your super sweet card, Tracey! Fabulous take on the sketch! Fun take on the sketch, Tracey! Love your paper pieced popsicle! Aah, Tracey, right back at you girlfriend! I love you, too! Thank you so much for your sweet words and for this very delightful fresh and summery Popsicle card!! I love it! I think it rocks these challenges, too!! Thank you for joining in my surprise linky party at Ardyth's!! Oops, sorry, me again. I forgot to grab these drinks! Thanks!! What a great card for Darnell! Perfect adaptation for all those challenges. Wonderful card for Darnell - love the numbered paper inside the popsicles - very clever!! And if I were in high school, I'd want to plant myself with Darnell and you, too! Fabulous card that I knew she'd love when I first saw it! Fun, fresh and fantastic!